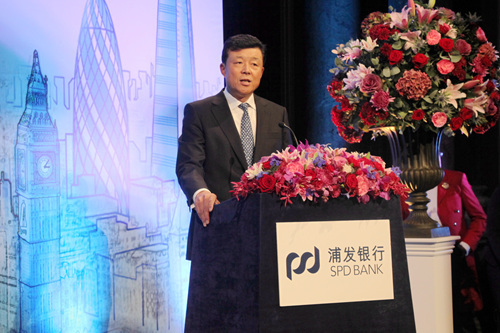 I warmly congratulate the launch of the Shanghai Pudong Development Bank London Representative Office! In English I think it easier if we say SPDB! Established in 1992, SPDB is a young bank. It is young - even in China's banking sector. However driven by the vigor of youth SPDB has grown from strength to strength over the past 21 years. That youthful energy is also balanced with mature prudence and wisdom. PDB has a strong commitment to integrity and relentless pursuit of excellence. The achievements of SPDB are exceptional. By June this year, SPDB's total assets had exceeded 3 trillion RMB. Last July, SPDB for the first time became one of the Fortune top 500 companies in the world. · Accelerated reform and opening up in Shanghai. · The launch of the new Pudong Development Area. · Joint-stock commercial banks going public in China. · And China's drive to achieve financial reform and innovation. SPDB has followed the trends of the times and advanced in the pace of the times. · Already the five main commercial banks in China have opened one branch and four subsidiaries here. · Already China Guangfa Bank and China Merchants Bank have opened their representative offices in London. 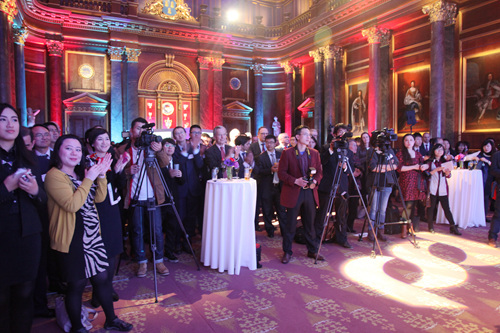 · This is the fifth time I have attended the launch of Chinese bank business in Britain! However, as the English saying goes – SPDB is by far 'last' but by no means the 'least'! · The establishment of the Shanghai Free Trade Zone. · The China-UK currency swap agreement. · And London's ambition to become a leading centre for off-shore RMB business. What is significant for SPDB is the recently held fifth China-UK Economic and Financial Dialogue in Beijing. This produced a series of outcomes on bilateral financial cooperation. In particular, allowing Chinese banks to open branches in UK. "A youth is to be regarded with respect"
"A colt may become a great horse". SPDB has done exceedingly well on the banks of the Huangpu River in Shanghai. I am confident that SPDB will seize the new opportunities and catch up from behind. We look forward to greater success from SPDB on the banks of River Thames in London.